The early history of this family is uncertain, as it is believed that some of the account in the Chronicle of Alnwick Abbey is fictitious. It is possible that two sons of Gilbert Tyson, William and Gilbert, were at one time feudal Lords of Alnwick and Malton respectively. But according to the Alnwick Abbey chronicler, William the Conqueror gave to Ivo de Vescy the baronies of Alnwick and Malton in marriage with the daughter of William Tyson. The inscription on stained glass in New Malton Parish Church (Pyson and 1090) suggests a Pyson was Lord of the Manor of Malton c.1090. William Tyson's daughter was married to Ivo de Vesci who was still alive 63 years later. The discrepancies in accounts seem to be unsolvable. Recommended reading includes: "Northumberland Families" (Vol. 1, W. Percy Hedley, 1968). [TYSN351] Gilbert Tyson of Alnwick m. ?
. [TYSN361] Lord William Tyson of Alnwick m. ? [TYSN351] Gilbert tison [=firebrand] may have held the Barony of Alnwick (Northumbs). [TYSN361] William Tyson (presumed son of Gilbert), may have succeeded to the Barony of Alnwick. [TYSN372] Jane (Alda) Tyson (daughter of William, and also said to be the granddaughter & heir of Gilbert) married [VESC371] Yvo de Vesci (see under ALNWICK below). [VESC371] Yvo de Vesci (from Vassy, Calvados), of Alton, married [TYSN372] Jane Tyson (see TYSON above), and is said to have thereby acquired Alnwick and Malton lordships. He began the construction of Alnwick Castle (1097), and appears to have died some time after 1153 (in which year he witnessed a charter of his son-in-law Eustace FitzJohn). [VESC382] Beatrice (only daughter & heiress of Yvo) married [EUST381] Lord Eustace FitzJohn of Knaresborough (see FITZEUSTACE). 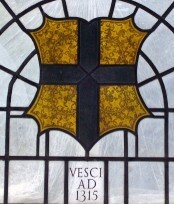 Their eldest son William afterwards took the name of William de Vesci.